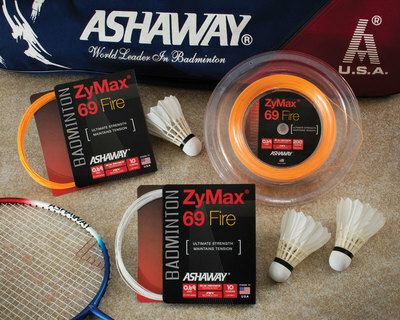 Ashaway, RI - Ashaway Racket Strings has introduced ZyMax® 69 Fire, the heavyweight in its new line of ZyMax badminton strings. The line incorporates Ashaway’s proprietary BETA polymer fibers, and is constructed using the company’s special ZyWeaVe™ string core technology. At 0.69 mm ZyMax 69 Fire is the heaviest string in the line, and is designed to provide chronic string breakers with the best in dynamic stiffness for excellent feel and repulsion; optimum power and durability; incredible knot and loop strength; and exceptional tension holding ability for consistent reliable performance. ZyMax 69 Fire strings are designed for high performance players and feature a BETA polymer ZyWeaVe core encapsulated with a high tenacity BETA polymer microfilament wear surface. As part of the ZyMax Fire line, they are one of the first to offer the benefits of this new BETA polymer, including a 25% improvement in elasticity and dynamic stiffness over most popular badminton strings. ZyMax strings generate excellent feel and repulsion, as well as optimum power and durability, and incredible knot and loop strength. Ashaway’s trademarked ZyWeaVe technology generates a string core that is stronger and holds tension better than traditional badminton strings. This allows for thinner, more playable strings that perform consistently at higher tensions throughout the life of the string. ZyMax 69 Fire strings are available in traditional Ivory White and in a distinctive “Fire” Orange color, and in either 10-meter sets or 200-meter reels. Recommended stringing tension is up to 40 lbs., depending on player preference and racquet frame manufacturer’s recommendations. Ashaway Racket Strings are made by Ashaway Line & Twine Mfg. Co., the only U.S. manufacturer of string for squash, tennis, racquetball, and badminton. Operated by the Crandall family since 1824, Ashaway has been making racquet strings since 1949, and is responsible for several important technical innovations. Ashaway has been the Official String of USA Racquetball for more than ten years, and is also the Official String of Professional Tennis Registry. Ashaway Line & Twine Mfg. Co. also makes braided products for medical and industrial applications. For more information visit ashawayusa.com.